“All great, simple images reveal a psychic state. The house, even more than the landscape, is a “psychic state,” and even when reproduced as it appears from the outside, it bespeaks intimacy. Psychologists generally, and Francoise Minkowska in particular, together with those whom she has succeeded interesting in the subject, have studied the drawing of houses made by children, and even used them for testing. Indeed, the house-test has the advantage of welcoming spontaneity, for many children draw a house spontaneously while dreaming over their paper and pencil. To quote Anne Balif: “Asking a child to draw his house is asking him to reveal the deepest dream shelter he has found for his happiness. If he is happy, he will succeed in drawing a snug, protected house which is well built on deeply-rooted foundations.” It will have the right shape, and nearly always there will be some indication of its inner strength. In certain drawings, quite obviously, to quote Mme. Balif, “it is warm indoors, and there is a fire burning, such a big fire, in fact, that it can be seen coming out of the chimney.” When the house is happy, soft smoke rises in gay rings above the roof. Often a simple detail suffices for Mme. Minkowska, a distinguished psychologist, to recognize the way the house functions. In one house, drawn by an eight-year-old child, she notes that there is ” a knob on the door; people go in the house, they live there.” It is not merely a constructed house, it is also a house that is “lived-in.” Quite obviously the door-knob has a functional significance. This is the kinesthetic sign, so frequently forgotten in the drawings of “tense” children. 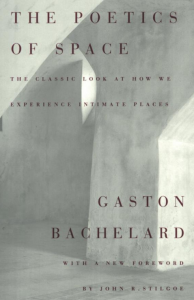 Posted in Feng shui books reviews, Feng shui philosophy and tagged Poetics of Space by Gaston Bachelard.